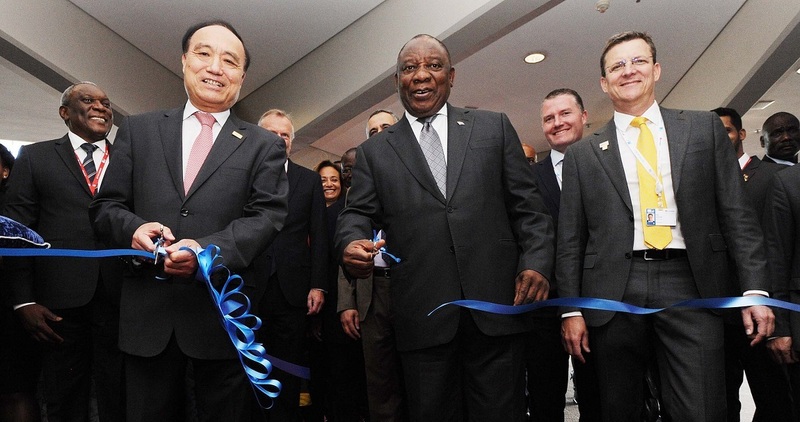 President Cyril Ramaphosa and ITU Secretary General Houlin Zhao cut the ribbon to mark the official opening of the conference exhibition. ITU Telecom World is an annual exhibition and forum for Government and industry leaders to explore challenges, partnerships, solutions, and identify investment opportunities and best practices for socio-economic development through Information and Communication Technologies (ICTs) #ITUinSA18. South Africa. 10/09/2018. On Monday, President Cyril Ramaphosa officially opened the 2018 International Telecommunications Union (ITU) Telecom World Conference at the Durban ICC, which is taking place in the African soil for the very first time since South Africa joined it in 1994. Thousands of delegates from all over the world, including government members, entrepreneurs and leaders of multilateral organisations descended on the Durban International Convention Center (ICC) to attend the three-day event aimed at discussing and showcasing latest technology developments, including G5 networks. Addressing thousands of delegates, President Ramaphosa said that he expected great suggestions and innovation from the delegates to improve a lot of humanity in the world. â€œThis is the most important sector of various economies around the world… the telecommunications sector. We as Africans feel proud and honoured that ITU has chosen to come to Africa and KZN to host this event. â€œITU provides a guide and compass for the future, to navigate this new bright and brave world that many countries are traversing to understand the meaning of the new technology. The deliberations taking place here will concern the economy and society that we are building for tomorrow,â€ he said. He added that this was the dawn of a digital revolution that will reshape the way we live and relate to each other. CEO of MTN group Rob Shuter acknowledged everyone’s need to be connected in a modern life. â€œEveryone deserves the benefits of a modern connected life. Iâ€™ve seen how connectivity has changed the lives of people in all our markets,â€ Shuter said. He added that meanwhile there’s been remarkable mobile growth there are still people who aren’t enjoying benefits of the internet.â€œDespite significant mobile growth, almost 2 billion of the 5 billion subscribers are unable to enjoy the benefits of the Internet. This argues for the pressing need to bridge the digital divide, he said. â€œThis is a hard goal and we must all work together for connectivity,â€ Shuter added. Featured image by Siyabulela Duda, GCIS.